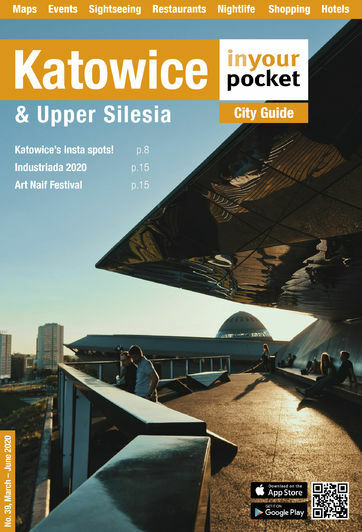 Courtesy of Katowice City Council. 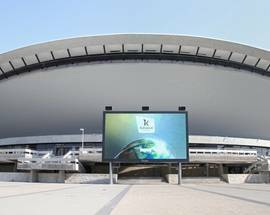 If you get to the brand new sparkling Rynek and see a strange unidentified lying object at the end of Al. 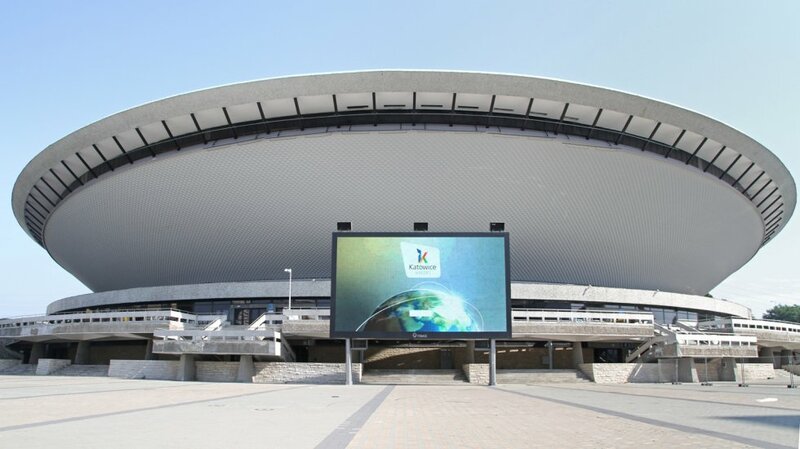 Korfantego, the odds are you're looking at Katowice's very own flying saucer! 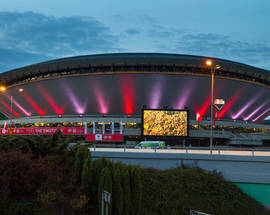 This multipurpose 'space age' sports and concert venue has a rather colourful history as you might expect and has the ability to play space tunes whenever the lights go on. So where does the story begin? 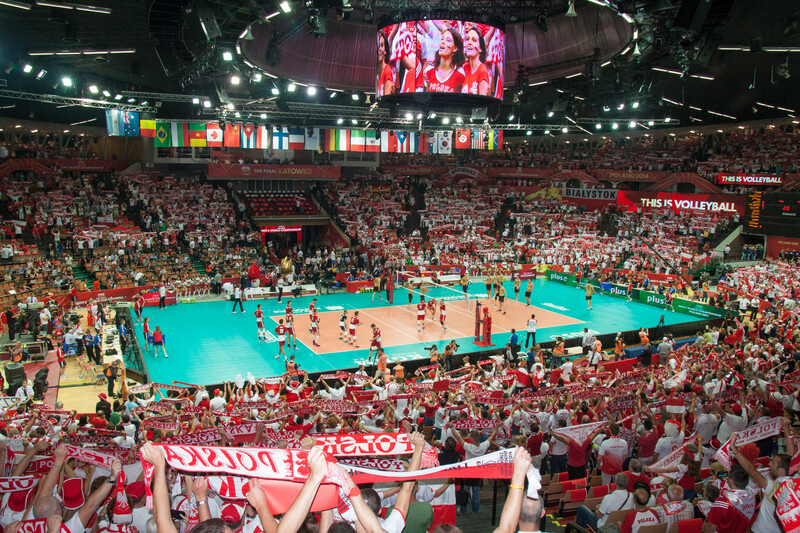 Quite naturally in the 50s, a time when Katowice was known as Stalinogród and Poland resembled a giant brickyard. By the time WWII came to a close there wasn’t much to look at in Poland, and so the architects got busy with their designs and blueprints. While Stalin was around the planners had a strict style to follow, Socialist Realist, but the moment he was spirited into the sky all hell broke loose as Polish architects let their imaginations run riot. 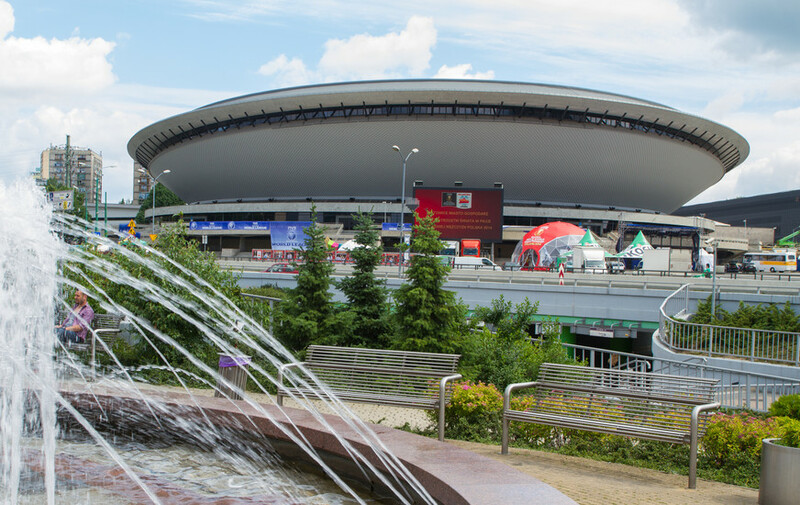 So it was in this atmosphere when the whole planet was striving to create a Brave New World that a competition was launched to see who could design an indoor arena for the people of Katowice. 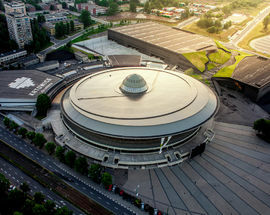 Held in 1958 and judged by the Association of Polish Architects the contest was won by a Warsaw company, the winning design being the brainchild of Maciej Gintowt and Maciej Krasiński. 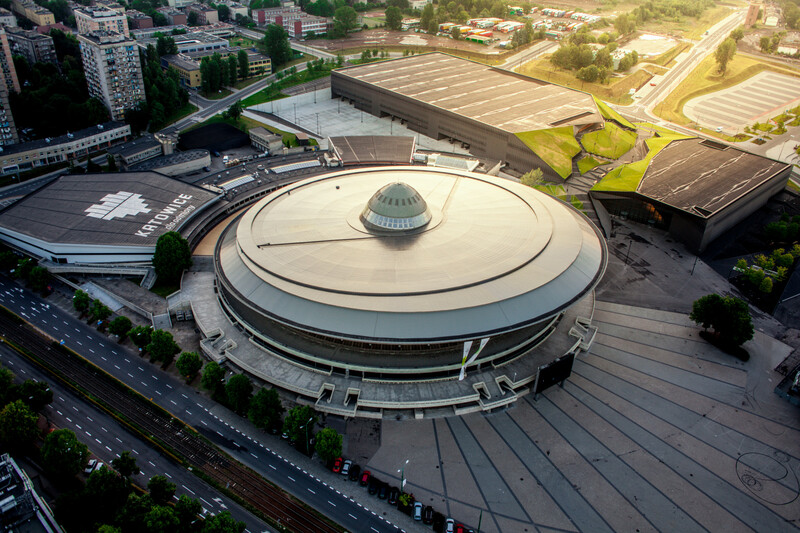 The resulting Wojewódzka Hala Widowiskowo-Sportowa w Katowicach (translating something like Katowice Province Spectator & Sports Arena) was built in stages between 1964 and 1971, and at 246,624 square metres is one of the largest, certainly one of the strangest and, to some, the most beautiful piece of reinforced concrete in Poland. 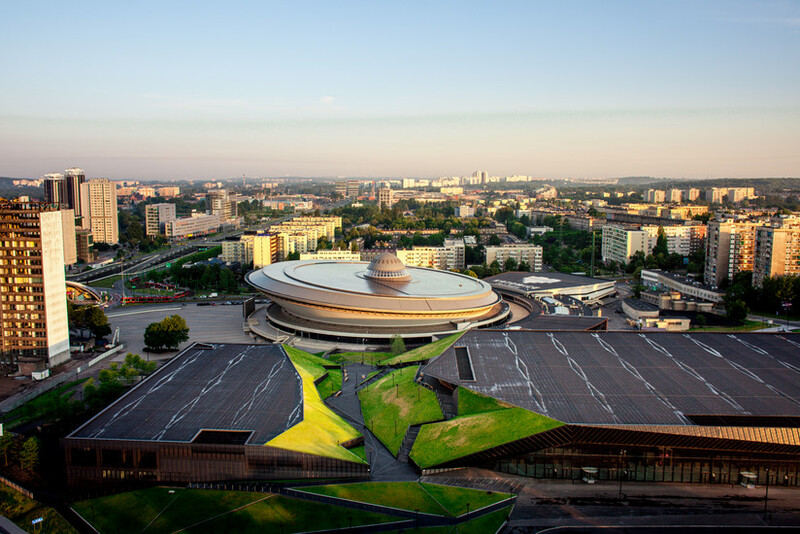 Nicknamed Latający Spodek (Flying Saucer) the building was originally going to be built in Silesia Park but because of its avant-garde appearance finally landed in the city centre. Holding 11,000 people part of the building was in use in 1969, though the grand opening only took place on May 9, 1971. The reason for this delay was simple – in their wisdom the designers had picked a landsite suffering ‘medium mine damage’. That meant the possibility of cave ins and collapse so the building was road-tested by 3,500 stamping (and dare we say it, nervous) soldiers. Given the thumbs-up by equally relieved engineers the building has been inspiring and amusing people ever since. And if you think it looks weird now, think what the conservative locals must have made of it when the ribbon was finally cut. This was one of the first structures in the world to use what boffins refer to as Tensegrity, i.e. converging forces to hold that roof in place. The engineer responsible for this piece of genius was Wacław Zalewski, and it was he who came up with the mind-blowing design of Warsaw’s legendary SuperSam store; a veteran of the Warsaw Uprising Zalewski’s SuperSam was the first self-service supermarket in Poland, and his innovative design won an honorary mention at the 1965 Sao Paolo Biennale. 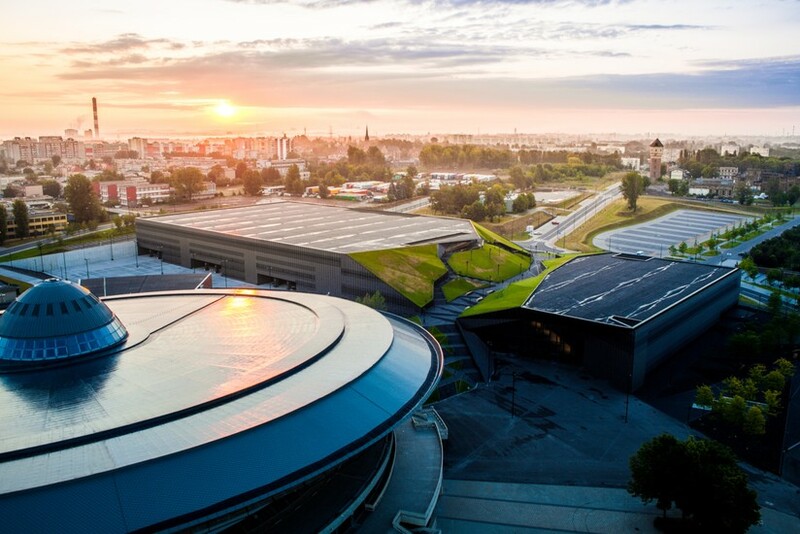 But while it was considered ultra-modern at the time, Zalewski’s Warsaw project was pulled down in 2006 after great big chunks of it started falling on people. 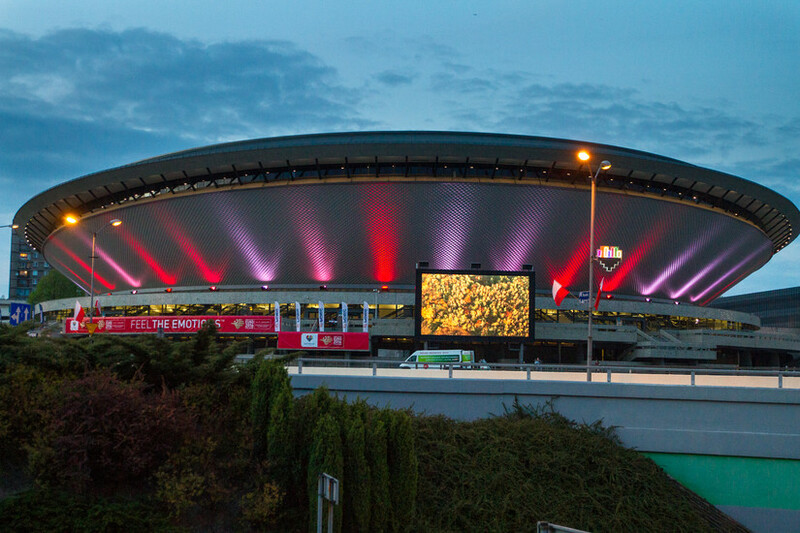 While officials persistently deny that the Spodek is in danger of sharing the same fate it is one of Katowice’s more enduring rumours that the structure is about to give way at any moment. For that reason alone, check it out while you can – just don’t blame us if you find yourself buried alive. 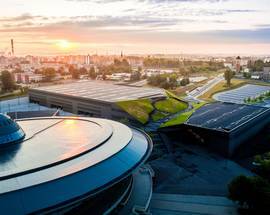 But while these urban myths abound they’ve done nothing to dent the Spodek’s appeal and a re-modelling of the inside in 2009 resulted in the opening of the Diament Spodek Hotel (see Hotels). 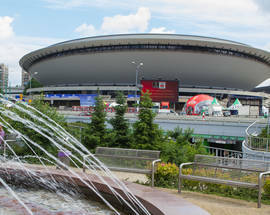 A popular sporting venue (its hosted the final stages of EuroBasket 2009 among other tournaments), Spodek is also Katowice’s number one place for international rock concerts, having hosted a disparate collection of stars including Charles Aznavour, Metallica, Depeche Mode, Elton John, Slipknot and Robbie Williams. Pearl Jam liked it so much that they released a bootleg of their performance there, while the Smashing Pumpkins went one better and featured it on the inside cover of their album Adore. Believe it or not, fans of Steven Spielberg’s 1977 blockbuster Close Encounters of the Third Kind will be delighted to learn that some clever clogs with a smashing sense of humour has installed a system that plays a variation of the classic five-note alien encounter tune from the film whenever the building’s lights go on. 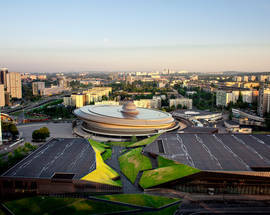 Indeed, what Katowice lacks in normal tourist material, it more than makes up for its oddities. Beautiful it’s not. Absolutely crazy, it most certainly is. 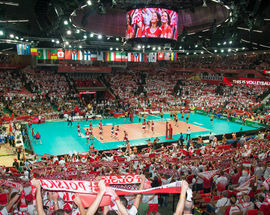 Who needs Kraków?